Undocking is a bit painful with my E6500. Dell has a “hot dock” mechanism where you essentially just remove the laptop from the docking station and the system keeps on running. However, Win7 doesn’t seem to spot that this has happened – the internal LCD doesn’t turn on as the main display. I’ve taken to sending the laptop to sleep before undocking and that seems to be a sufficient workaround for now. I suspect there are some drivers missing that tell Windows about the docking hardware properly. Had my first BSOD with Win7 – not sure what caused it as I’m not really one for understanding BSODs ;-). I was downloading some stuff from the web and copying a file from a Zip file to the hard drive. Since the BSOD, I’ve run the memory test and checked the C drive and everything came up clean. Ho hum. Installed Symantec’s Endpoint Protection 11, MR4 MP2. 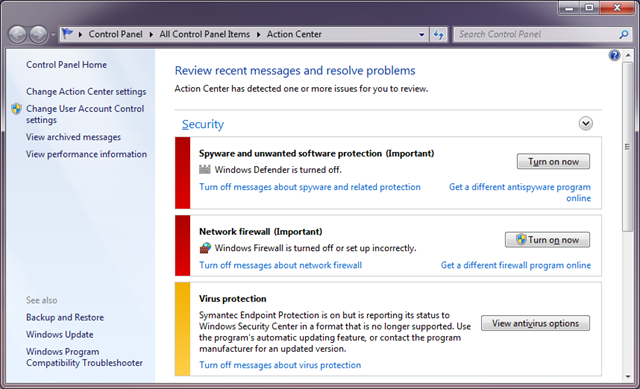 Installation was successful but Windows wants Defender turned back on and the firewall turned on. Interestingly, the Action Center is also reporting that SEP is reporting its status in a format that is no longer supported!